Facebook Page Not Found in Facebook Search? One of Wild Apricot's blog readers got in touch recently with a Facebook question that has plagued other nonprofits from time to time. 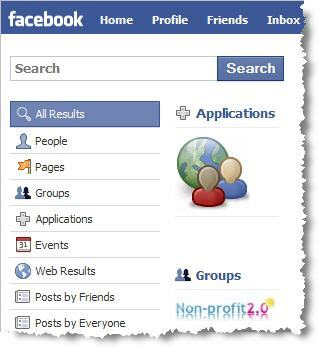 He created a Facebook Page for his nonprofit organization, but the new Page doesn’t show up in the results for Facebook’s own Search tool. 1. Is there some time it takes to update? 2. Are FB pages not searchable? Here’s what I came up with for reasons why a Facebook Search might not find the nonprofit’s Facebook Page, and what to do about it — but I have a feeling that I may be missing something here, so please do chime in with a comment if you have any thoughts on this problem! Yes, from what we’ve seen, there often can be a bit of a time delay for Pages to show up in Search. Depending when you set your Page up, it may just be a matter of waiting a bit longer. Yes, Facebook (Fan) Pages are searchable. In fact, they’re searchable by search engines like Google, as well as by Facebook Search itself. You can see if Google has indexed your FB Page yet by doing a search like site:facebook.com “your Page name here” — and try the same on other major search engines. If Google and the gang have your Page indexed and listed in search results, then you’ll have a good idea that the source of the problem is a Facebook Search glitch. If so, you can bring this to Facebook’s attention via their “Page not displaying in Search” contact form. When you first create a Page, there’s a final step to take — “publishing” — to move it from draft status to public view. If it’s not “published” to the public (or if Facebook doesn’t think it’s published), it won’t show up in Search. You also won’t be able to share the contents of an unpublished Page with another website; for example, linking your Facebook Page with your Twitter account. If you visit http://facebook.com/twitter and try to add the application to your unpublished Page, there’ll be a big notice telling you to publish it first. One quick and easy way to double-check that your Page has been officially published is to copy the URL for your page, log out of Facebook, then try to visit that URL. If the Page isn’t published, you won’t be able to see it when you’re logged out of Facebook. Privacy settings may be restricting who can search for (and become a fan of) your Page. On your Page, click “Edit Page” link; in the Settings section, click the pencil icon and choose “Edit” from the dropdown menu; check settings and adjust as needed, and click “Save Changes”. What else might keep a Facebook Page out of Facebook Search results? If you’ve had experience with this problem and insights to share — or even a theory you’d like to float — please do jump in, in the comments! The first thing I thought of when I read this question was the privacy settings. Some people do set it where their profile or fan page is kept out of the search results as they do not want to be "found." The second thing would be the time it takes for the information to propagate through the system. Facebook is a gigantic database, spread over many servers. Just as Google's massive index does not reflect changes instantaneously, so Facebook's also takes some time. But there's one additional issue to consider. Facebook's search is very weak and very literal. Sometimes you have to enter the organization's name word for word (including helper words like "the") to have it come up in the search results. Facebook fan pages show up in search results ordered by # of fans when it shows up in "all results". However you can segment your search by clicking "Page" in the right column and then go on to choose in a drop down menu titled "show" and choose "nonprofit". Something that helps is once you get 1000 fans you will receive your own URL...but that's only when you get 1000. I second what Jessica says about making sure to filter results by "Page"--especially when there may be multiple groups created by members, staff or fans with the same company name your page is using. I believe the number of fans you need to claim a unique username is only 25, though--it started off way higher but now I believe it's only 25 for nonprofit pages. Maggie - thanks for pointing out the unique URL tip - Facebook changed it!!! To create a unique username for your page go to facebook.com/username and then click on "set a username for your Page". NOTE you can't change your username, so pick it wisely! Can't Register a Facebook Page Username? I have a page for an event "Oregon Dodgeball Classic" and suddenly it will not come up when it's put in the search box. If I start typing in Oregon Dodgeball Classic and the drop down appears, and I click on that, it will go directly to the page. People interested in this event cannot access the page. How can I solve this? Sam, although Facebook's Search function is notoriously wonky, in your case I can't find your Page in Google search either. If it is a Page (rather than an Event), it should show up in both searches, in theory! But if you can see the page and no one else can access it, the first thing I'd check is the privacy settings for your Page. Any chance that those got changed, accidentally, somewhere along the line? p.s. the point about checking your privacy settings will still apply. See http://www.facebook.com/help/?faq=13052 for help on that.